This makeup cake was made for my mother-in-law’s 50th birthday and includes a purse, cosmetic bag and a variety of makeup items which are all edible. I baked 2 round cakes the day before the party. When cool, I sandwiched the cakes with buttercream frosting. 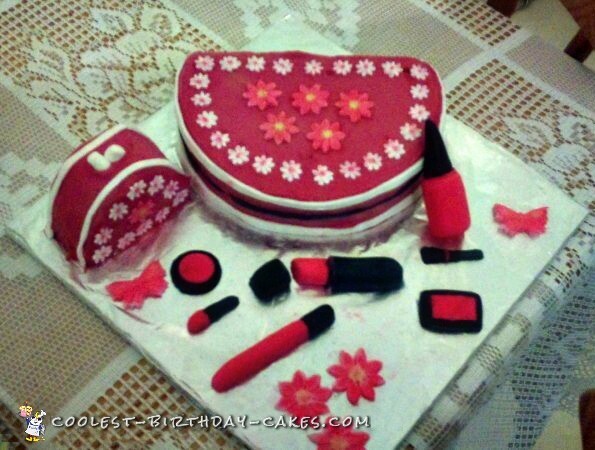 The cosmetics were made from fondant which I rolled and moulded into shapes by hand (lipstick, eye shadow, gloss, brushes, nail polish, etc.). The makeup bag is a round cake with a piece cut out of it so that it resembles a bag. For the purse I used the cake that came out of the bag I cut and shaped it. I then refrigerated the pieces for an hour. Next, I dirty iced the purse and makeup bags and refrigerated them once more. The final icing was then added, with attention paid to smoothing out all of the lines and bumps. Fondant flowers and butterflies which were made with a press cutter were added. 2 thin white fondant ribbons were cut and used to line the edges of purse and makeup bag. 1 black fondant ribbon was used as the zipper for the purse. Once complete, the cake was left to rest for a few hours before the party.